It is a prayer we hear every single time we participate in the celebration of the Mass. We rarely stop to think about which human hands made this bread, utilizing an ancient and unchanging recipe of wheat flour and water. 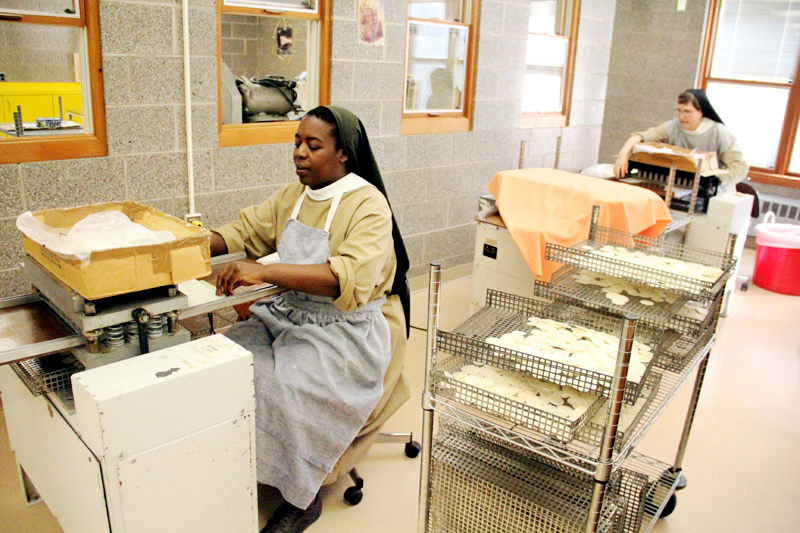 In the Philadelphia Archdiocese those hands very often belong to cloistered Poor Clare nuns. Although they won’t be there to see it, the 100,000 hosts they have been baking over the last two months will be among those consecrated and consumed by the faithful at the papal Masses this weekend. The sisters probably have been making hosts in their monastery since either 1917 or 1918, Sister Jean estimates. At this time the ministry is under the charge of Sister Anne Bartol, and she is assisted by about six other sisters. Once baked, communion hosts can last a very long time without spoiling, which is a good thing, because the Poor Clares have been working on this special order along with their regular orders for the past two months. The reason it is so time consuming is because baking hosts is a secondary work for the sisters. Their real ministry is prayer, and there will be many prayers for Pope Francis and the World Meeting of Families. Still, “We are thrilled and really honored to do this,” Sister Jean said.